Why Will You Love Driving the INFINITI QX50 in Westwego, LA? SUVs continue to be a popular choice among drivers everywhere. When you’re ready for a high-quality model to drive in Westwego, LA, you should get into the INFINITI QX50. This amazing SUV is not only durable and powerful, but it provides a luxurious ride with a host of great features. You’ll enjoy a smooth, comfortable ride everywhere you go. You need a powerful engine when you have an SUV. Its strength will help you tow other vehicles, carry heavy loads, and navigate any terrain you encounter in Westwego, LA. Its engine is a 2.0-liter, 16-valve, inline 4, DOHC one that puts out 280 foot-pounds of torque at 4,400 rpm, and generates an impressive 268 horsepower at 5,600 rpm. Its turning circle is 36.4 feet and it has variable valve timing. The INFINITI QX50 seats five people and give you the space you need to spread out. The seating arrangements won’t cramp you or your passengers. Both the passenger and driver’s seat has eight-way power adjustments. The driver’s seat also has lumbar support. In the front seats, you’ll have 40 inches of headroom, 57.9 inches of shoulder room, 39.6 inches of legroom, and 55.6 inches of hip room. In the back, riders will enjoy 38.4 inches of headroom, 53.8 inches of hip room, 38.7 inches of legroom, and 57.1 inches of shoulder room. All seats have leather or leatherette options. You’ll use your SUV for everyday use and for off-road fun. You can’t afford to drive something with poor gas mileage. Luckily, you can go far in Westwego, LA, on a single tank. It has a 16-gallon tank and gets 24 miles per gallon in the city and 30 miles per gallon on the highway. Every time you fill up, you’ll be able to go 384 miles in stop-and-go traffic and 480 miles in the freeway and highway. Step inside the INFINITI QX50, and you’ll have a wonderful experience driving and riding in this SUV. It comes with a leather tilt and telescopic steering wheel and the ever-popular three-zone climate control. You’ll have an overhead console and front seatback storage to put your items, not to mention plenty of space in the trunk for larger materials. There are several other reasons to check out the INFINITI QX50. 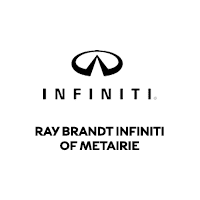 It’s the ideal SUV to drive in Westwego, LA, and Ray Brandt INFINITI should be your first stop.